Moving off the shore to probe deep water with ultralight gear is the quick route to a mixed bag of fall panfish. OutdoorTom.com photo. 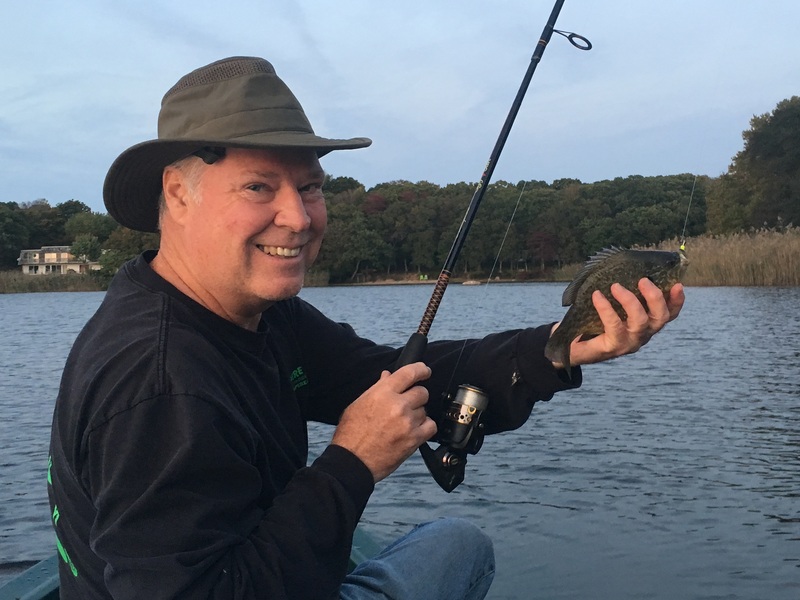 Most serious northeast and mid-Atlantic anglers are familiar with the fantastic mixed-bag bottom fishing for porgies, sea bass, triggerfish and the like that takes place each fall. Surprisingly few, however, seem to realize that a special gathering of assorted species also develops in our local lakes and ponds in October and November. 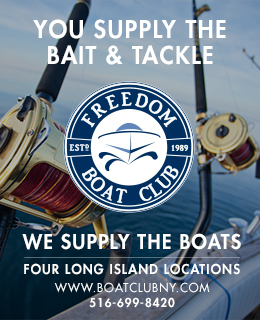 Break out some light spinning gear and you can get in on this fun as well, catching a mix of some of the year’s biggest yellow perch, bluegill, pumpkinseed and crappie. Most trips will also find a bigmouth bass and pickerel or two joining the blitz and, on some lakes, white perch, bullhead catfish, trout and even walleyes are additional possibilities. Some of the year’s biggest yellow perch are on patrol in open waters during October. If they pass on micro-jigs, try a small spinner. Photo by Tom Schlichter. Just as saltwater bottom fish tend to school tightly during the fall feeding binge, freshwater panfish travel in condensed packs once the water begins to chill. Often, these fish will stack up in eight- to 12-foot depths – a simple fact which eliminates a lot of smaller lakes and ponds from consideration of this pursuit because they are too shallow. It also means you’ll do best if fishing from a boat or kayak since the better waters can be difficult to reach by casting from the shore. That’s not to say your local mill pond isn’t fishable this time of year, just that for this super-tight schooling to set up the fish need deeper, gin-clear water and temperatures that are steadily on the decline. Figuring out exactly where the fish stack up is the most difficult part of this game. Ferret them out, however, and you may find that the panfish will hold relatively in place right through Thanksgiving. I like to anchor near deep holes or drift along pronounced slopes, casting and jigging methodically until I feel those first light taps that signal pay dirt. Generally, this happens with my jig near the bottom but it remains vital to probe the entire water column because panfish packs frequently suspend at mid-depths. 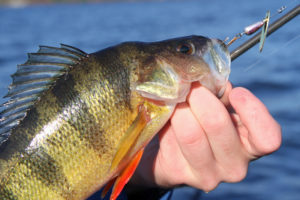 Since panfish are your primary target and bass, pickerel, trout or walleye are bonus catches with this particular strategy, it makes sense to use ultralight tackle and lures small enough to fit easily in the mouth of a bluegill, crappie or perch. Four-pound test spinning gear is ideal for this application, offering enough sensitivity to feel the slightest tap while providing a fighting chance should something big inhale your offering. In addition to micro jigs and tubes, a variety of small lures will score in deep cold water. These slightly larger choices will cut down your sunny catches but increase your odds with big perch, crappies and bass. Photo by Tom Schlichter. In terms of lures, small tubes and grubs are my favorite choices because they interest as many perch and crappie as they do bluegill and pumpkinseed. Berkley Gulp! and Gulp Alive! panfish lures work quite well, especially the leech, fish fry and cricket patterns. Curly-tailed grubs measuring two inches or less are also effective, especially when tipped with piece of garden worm or a single Berkley Gulp Alive! Maggot Micro Bait. 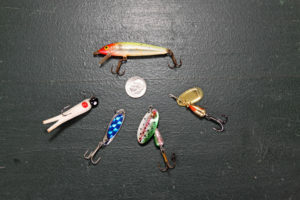 Other lures that work well for mixed bag freshwater action include ice fishing jigs such as Northland Fishing Tackle’s Slug Bug, 1/10- and 1/5-ounce Swedish Pimples, and 1/12- to 1/8-ounce Acme KastMasters. Small Panther Martin spinners are also a good bet, especially if big perch seem to be feeding high in the water column. Jigging is the way to go when trying to turn on the fall season panfish patrol. Experiment by gently lifting and dropping your lure until the strikes begin to take hold. If you continue to catch the same type of fish one after another, jig a little higher or lower in the water column to see what else may be around. White perch, for example, often hold within a few feet of the surface while yellow perch will suspend three or four feet above the bottom. The biggest bluegill and pumpkinseed tend to sulk down deep, but an occasional surprise walleye, pickerel, bass or even trout can spring upon your lure at any depth. Mixed bag freshwater action is already underway and should be in full swing by mid-October. As always, please use discretion when the fishing is hot, and be sure to carry a long-nosed pliers or forceps to help remove hooks from your quarry. You might also want to bring along a novice or two as this mixed-bag freshwater fun is the perfect way to introduce children and beginners to the more relaxing side of fishing that is often pushed aside in pursuit of bigger game. Enjoy.